Harrowing, funny, and instructive are an unusual combination of adjectives, but they aptly apply to Tom Hooper’s “The King’s Speech”. Colin Firth as the socially anxious George VI and Geoffrey Rush as the insightful speech trainer Lionel Logue, both give sensitive, commanding and convincing performances. In this film stuttering, known by the British term stammering, is almost on full display. The verbal behaviours of repetitions, prolongations and blocks plus the secondary struggle behaviours of eye twitching, head jerking and mouth/facial contortions, are all portrayed. Also shown is stammering’s situational specificity as George’s difficulties vary with the social context in which he is placed. He is at relative ease with his supportive wife and children, has obvious difficulty with his demanding father and public speaking, and depending on the emotional demands of the conversation, has varying dysfluency with his brother. Furthermore, all the stuttering clichés for therapy and cause are presented, often humorously. Learning to speak with a mouth full of marbles, surgery, voice masking, diaphragmatic breathing, muscle relaxation, emotional release, conditioning and perseverance are all mentioned or shown. Possible causes such as emotional trauma, physical abuse and correction of left handedness are also brought up. The film portrays stammering with sympathy and accuracy (as expected given the writer David Seidler stammered) and will no doubt do much for stuttering awareness. However current understanding, research and therapy would make at least three additions for an updated public awareness message. First amongst these is recognition of covert stuttering, the situation where the speaker avoids or substitutes words so as to avoid an overt stutter. People who are covert stutterers give enormous energy to speaking as they monitor ahead all words and sentence structures. Second is the likelihood that the predisposition to stutter is genetic. A relative minor incident, or series of incidents, may prove to be significant for a person with a stuttering predisposition so that they are then “tripped” into stuttering behaviour. Thirdly the newly appreciated brain plasticity stresses the need for early intervention and suggests meditation and pharmaceuticals can be part of modern therapeutic practice. However the film’s strength is that the true nature of stuttering as a disability is obvious for all to see. Apart from the physical difficulty of speaking, stuttering was clearly impacting on George’s emotional health and on his relationships. George then is seen coping with both a physical disability as well as a mental disability. Unfortunately words are still not in common use to directly define this double disability. This new definition is necessary as not all people who stutter will be so affected, or remain so throughout their lives. This has an impact on understanding of dysfluent speech and on the provision of appropriate therapy. To correct this situation a new term has been proposed – Stuttered Speech Syndrome which links the physical act of stuttering with the mental disability of Social Anxiety Disorder. That is, George’s concern about his stuttering caused him to stutter more and to suffer clinically significant emotional ill –health. It also made it impossible for him to respond positively to rational advice. If it was available as a label then, a diagnosis of Social Anxiety Disorder could have been made to describe his psychiatric condition. The combination of stuttering and Social Anxiety Disorder, where one condition compounds the other, is to be known as Stuttered Speech Syndrome. 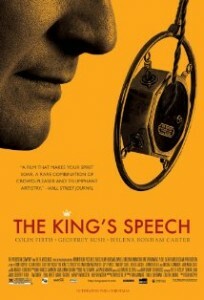 The film “The King’s Speech” sets up Stuttered Speech Syndrome very well. ie SSS – a situationally specific anxiety disorder related to the compounding effect of stuttering and social phobia. Unfortunately reviewers here in Australia are saying the film shows how Logue cured George VI of stuttering. However George continued to stutter all his life and, as all in the stuttering world know, current language prevents correction of this misinterpretation succinctly. But by using “additional” language provided by the term Stuttered Speech Syndrome, we could say the following:” Logue’s therapy reduced the symptoms of George VI’s Stuttered Speech Syndrome which allowed him to manage his stuttering and communicate effectively”. This film gives the stuttering community a wonderful opportunity to discuss and develop their public awareness message. In this way a disorder which until now has led sufferers to bear the brunt of ridicule and discrimination might be more sympathetically and more accurately regarded. “The King’s Speech” has the potential to join the classics of cinema by being emotionally engaging, historically interesting and socially relevant.